OBJECTIVE: SWBAT analyze their learning experiences by presenting their work in a digital portfolio and writing a 2-part reflection on each project. You are to create separate pages for all of your classes. They should be on your website as bread crumbs across the top of the page. At the top of each page should be a banner with a picture representing the class and the name of the class. All posted work is to have a title and reflection. Tell what you did, and what you learned. Reflect on the project itself - was it an effective project that helped you learn the material in a way that you can remember? Keep in mind, as always, I will give you individual feedback on your project and you will be expected to go back and make corrections to improve your grade. After you complete this project, score yourself with this rubric. Above is an example of a student's Digital Portfolio. You are to create separate pages for all classes that you have produced content for. Open the document you want to take a screenshot of. Resize the view so that you can see one entire page. If it is a multi-page document, you will take separate screenshots of each page. The cursor will turn into crosshairs. Repeat this process for all assignments you have created on the computer for ALL classes. 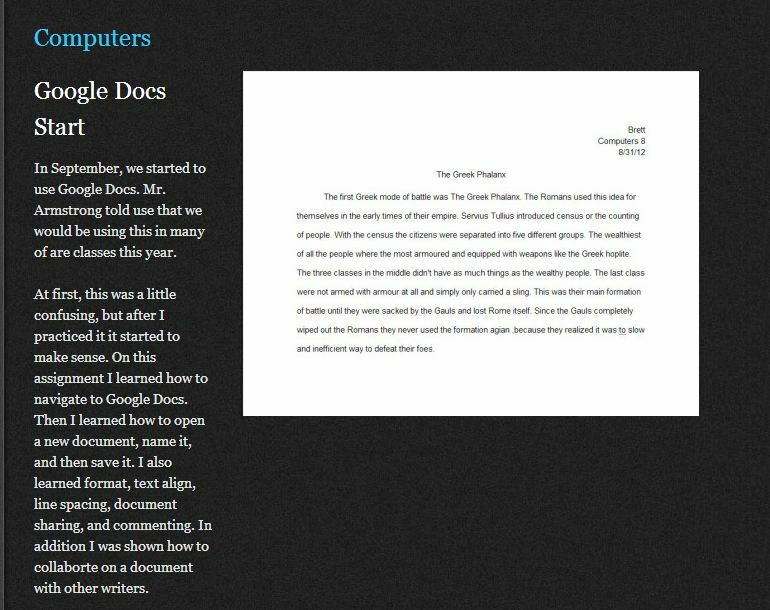 In the paragraph, describe the document, and what you learned from the project. Click on the links below to see Mr. Kimbley's video for each topic.